Bathtime can often be a challenge with Miss M who frequently insists she doesn’t need to wash and consequently it’s a battle to get her in the bath. But we usually succeed in having a fun and exciting bathtime by using extra bubbles, foam soap or some other novelty idea for children’s bathtimes. 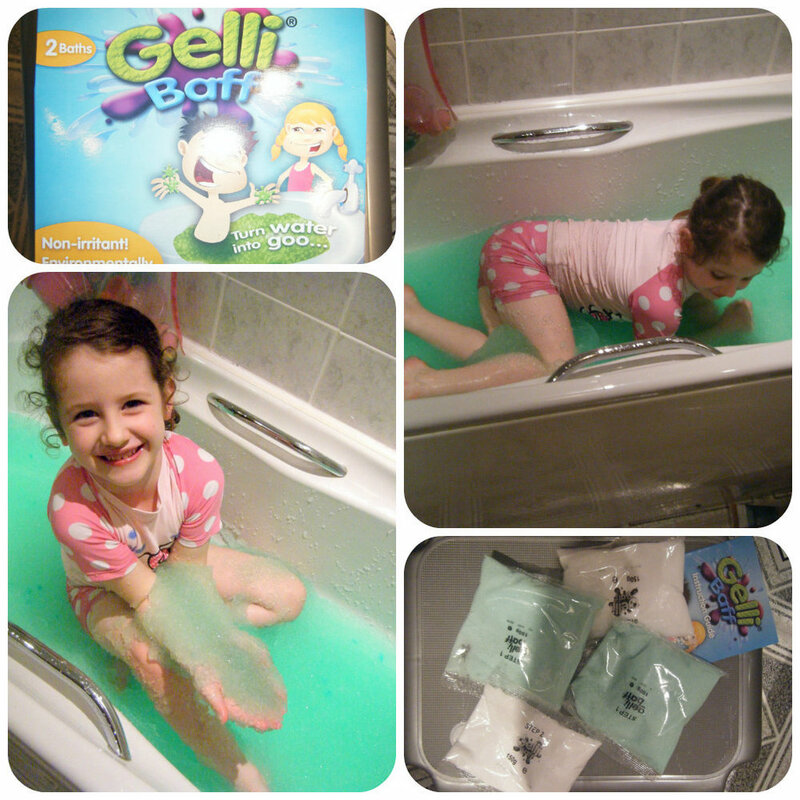 So when we were offered to try Gelli Baff for Izziwizzi, how could I refuse? We received a box containing four sachets, enough for 2 baths of Gelli Baff and 2 dissolver sachets in a Swamp Green colour. It was very easy to mix up – simply sprinkle a sachet over a 6cm of bath water and mix with your hand until it turns to jelly!! We found the mixture to be quite thick so added quite a bit more water until we got a gooey consistency that Miss M loved and couldn’t wait to swish around in. Five year old Miss M couldn’t wait to get in but unfortunately two year old Mister B looked at it in utter dismay and asked for water in his bath – bless him. But that didn’t deter Miss M who then spent the next 90 minutes squirming around in the Gelli Baff having so much fun – from pouring it in little pots and making potions, to laying flat in the bath relaxing in the jelly, to filling her swim top up with a huge amount of jelly and telling us she had a baby in her tummy!!! The colour was a lot more vibrant than the pictures show and I did have concerns about the colour dying Miss M’s swimwear or the bath but the reality is that there is no colour residue whatsoever and it all washes away extremely easily. The dissolver sachet, which is just table salt worked very well and with added water the bath soon turned back to liquid. I have no concerns about using this product at all and provided the jelly stays within the bath then there really isn’t any mess at all. Gelli Baff has definitely been a great source of entertainment for Miss M, she thoroughly enjoyed playing in it and has been asking for a jelly bath ever since. I think this is something that would be great to buy as an occasional treat and would recommend it.